Having reached the summer holidays, this month our regional advisers are sharing their favourite local historic site, to help you plan the long days of exploring you have ahead of you. One of my favourite local history spots is the newly renovated Lincoln Castle. The castle was built by William the Conqueror and you can see the motte and other features of the castle as well as walk all the way around the walls. You get an amazing view of the city of Lincoln and can really appreciate why first the Romans and then the Normans were keen to control this spot. As well as the Castle to explore there is the Victorian prison where you can see the separate system chapel as well as the cells and rest of the prison. You can even dress up in prisoner or the Governor or Matron if you want to! Until 4th Sept 2016 there is also the Poppy Wave exhibit commemorating the First World War. After visiting the Castle you may find yourself wanting to know more about the history of the local area; in which case The Collection is an excellent museum about 5 minutes walk from the Castle. It takes you through the history of Lincolnshire from the Stone Age to the Middle Ages with archaeological finds from each of the key periods. There are again opportunities to dress up in costumes as well as interactive displays. One of my favourite historic sites in Eastern England is the Abbey of Bury St Edmunds. Once one of the richest and most lavish monastic sites in England, today wandering through the ruins of the site gives you a hint of just how impressive the site must have been. The Abbey saw huge numbers of pilgrims visit the shrine of King Edmund, the last King of East Anglia (killed by the Viking Great Heathen army in 869). The site is an excellent example of how a historic morphs and changes, with later houses being built into the ruins of the Abbey and the cathedral cloisters and tower only being built in 2005. One of my favourite Yorkshire sites is Roche Abbey. The site itself is great because it is less busy than other Yorkshire Abbeys. What makes it really special though is that it has some amazing documents describing its spoliation. During the Elizabethan period, the minister Michael Sherbrook reflected on what led his parents’ generation to tear down Roche. He records all of this in a fantastically visceral set of accounts. You can find all of this via English Heritage’s “Heritage Explorer” site here. I recently visited the New Room in Bristol and was delighted to find this little gem right in the heart of Broadmead, the city’s main shopping area. The New Room is the oldest Methodist chapel in the world and was built by John Wesley in 1739. There’s lots to read about his role in the abolition movement, which fits very nicely into a wider look at Bristol’s history. Apparently, Wesley’s critics thought of him as a ‘dangerous enthusiast’ which sounds like something to aspire to. The New Room is a window into 18th century Britain and a peaceful oasis of calm in a busy city centre. It would make a great visit for anybody who is accompanied by people who are more interested in shopping than history: you can combine the two! This summer, I will also be visiting the Mary Rose exhibition. Having grown up in Portsmouth, I can just about recall the ship being raised (I thought it was made of yellow poles until I was at least 10) and I’m really excited to visit again to see what it looks like now that the years of preservation spraying has been completed. One of my favourite places for local history is Howarth. From the minute you approach the Bronte parsonage this place feels magical. The Parsonage itself is well worth a visit and allows you a glimpse into the lives of my three literary heroines. Walking down the cobbled streets it is hard to imagine how bleak times must have been. With the moors surrounding you, you are transported into each book. 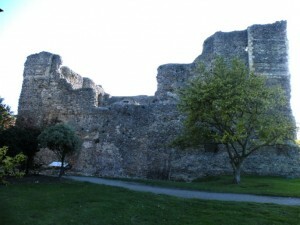 These are the remains of Canterbury’s first castle just inside the city walls. 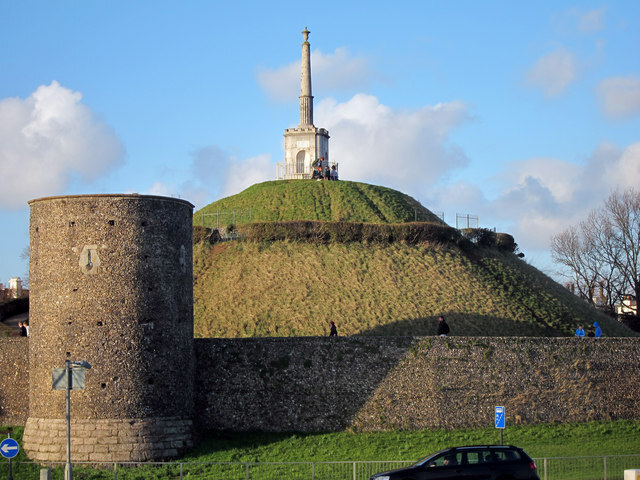 It was a motte and bailey castle probably begun within days of the Battle of Hastings when the Normans marched to Canterbury and the citizens quickly surrendered. The motte, which is all that can be seen today, was originally a Roman burial mound. It is known locally as the ‘Dane John Mound’, possibly a corruption of the Norman word ‘donjon’ (a tower). It was heightened, and the monument added, when the area was converted into public gardens at the end of the 18th century. the main entrance to the keep is is more diffficult to identify ; there are several later doorways at ground floor level cut through the thick walls of the keep. On the ground outside the keep there are traces of a flight of steps which were revealed by archaeological excavations in the 1970s. They finish directly below the remains of a large opening in the walls on the first floor (show in the middle of the photograph). 18th century engravings show a further row of joist holes just above the top of the existing walls, indicating the existance of a third floor. These were probably the private rooms of the Constable and his family. So the next time you visit Canterbury, remember that there’s much more to see than just the cathedral!